The US has long warned Russia about producing missiles that violate the 1987 Intermediate Nuclear Forces treaty. 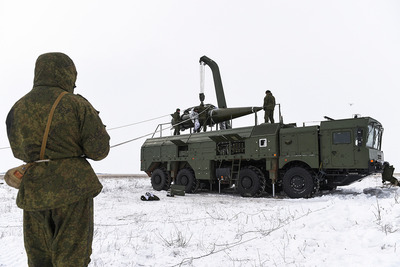 The treaty originally addressed a growing arms race that saw much of Europe targeted in Russian nuclear strategy and the US responding by deploying its own nuclear forces to Europe. UPDATE: This article has been updated to reflect Ambassador Hutchinson’s late clarification that her comments were about US counter-measures against Russian nuclear weapons, and not intended as a threat to conduct preemptive strikes on Russian nuclear sites. The US envoy to NATO said Tuesday that it might take counter-measures against Russian nuclear-capable missiles with military force if they don’t stop building the new weapons accused of violating a 1987 treaty. US ambassador to NATO Kay Bailey Hutchison said she thought the US and Russia could find a diplomatic solution to the perceived treaty violation, but would use force if necessary. The Intermediate Nuclear Forces treaty of 1987 sought to stop an arms race in Europe after Moscow in the early 1980s placed nuclear missiles capable of striking European capitals from its home turf. The US responded with a variety of its own comparable nuclear forces deployed to Europe during the height of the Cold War. The treaty was hailed as a success in arms control circles as having eliminated an entire class of nuclear weapons and largely denuclearizing Europe. Striking Russian missile facilities in Russia could very likely trigger war and would require a massive US military effort. Hutchinson may have been referring to “counter measures” in terms of missile defences or the proposed development of new US weapons that would target Russia’s treaty-violating missiles.